New York girl with brains and chutzpah meets quiet San Francisco boy with brawn, a winning smile and a heart of gold. 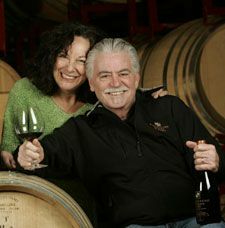 Renae and Bruce Perry have a zest for life, a passion for wine and food and a wonderfully wicked sense of humor. These elements are all evident when you visit Papapietro Perry Winery. Critically acclaimed Pinot Noir and Zinfandel attest to their passion for wine. Serving the winery staff meals, often produced from traditional family recipes, reveals their passion for food and their sharing spirits. And the logo t-shirt collection, with its PG ratings, will quickly reveal their sense of humor. The journey to where they are today took a few years. When Bruce Perry rolled up his sleeves one harvest at a Sonoma County winery, it wasn't because he was looking to change careers. During past harvests, Ben Papapietro had helped a mutual friend from work who was a partner in a Sonoma County winery. In the early '80s, Ben invited Bruce to join in on his winemaking adventure. A third-generation San Franciscan, Bruce grew up knowing wine was to share with family and friends over dinner. Even though his grandpa made the wine they drank, Bruce hadn't thought about making it himself. However, just one harvest at a winery and Bruce was inflicted with the winemaking bug. Now bitten, Bruce joined forces with Ben to make wine in Ben’s garage. By the 1990s, Bruce realized the garagista wines he and Ben were making could compete with other premium California Pinot Noirs. Armed with his passion and with the support of his family and friends, Bruce located a winemaking facility in Sonoma County where he and Ben could start producing wine in commercial quantities. Papapietro Perry Winery was born. In the 1990s, when their first vintage was ready to sell, the partners turned to Bruce’s wife, Renae Perry for her marketing expertise. Renae was working as a software-product marketing executive for a high-tech company in the San Francisco Bay Area when Papapietro Perry started to take off. It didn’t take much encouragement for her to exchange urban life for rural Sonoma County and join Bruce and Ben in their new venture. Renae now manages marketing and sales for the winery, along with other business operations. Bruce and Renae have easily adapted to country life, sharing their property with their dog Nola. As a couple who followed their dream, they know how fortunate they are to be doing what they love while living in one of the most beautiful places in California. Besides, they get to drink their fabulous Pinot Noir whenever they want. That could be one reason why they look so happy.